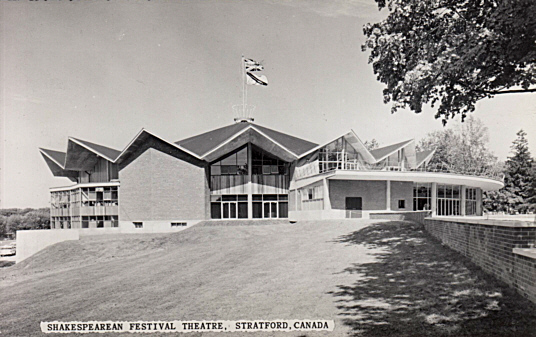 Built 1957 by Robert Fairfield as a permanent home to the Stratford Festival of Canada (before 1957, a provisional theatre tent was used). 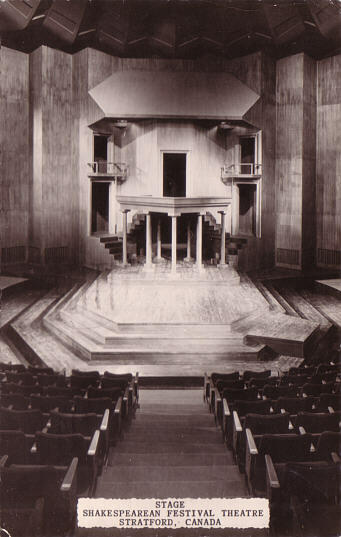 Stage design by Tanya Moiseiwitsch and Tyrone Guthrie. Opened 1 Jul 1957 with Shakespeare's "Hamlet". 1985 backstage extension. 1996-1997 restoration and rebuilding by Kuwabara Payne McKenna Blunmberg. 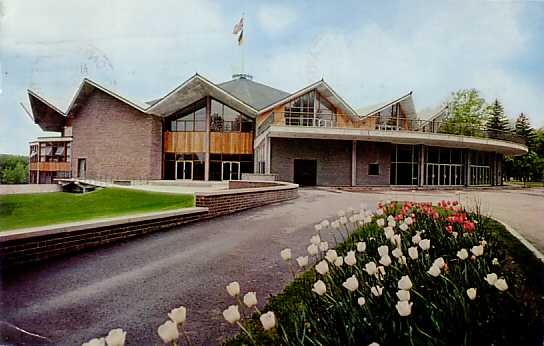 Re-opened 28 June 1997. Originally 2258 seats, today 1824 seats. 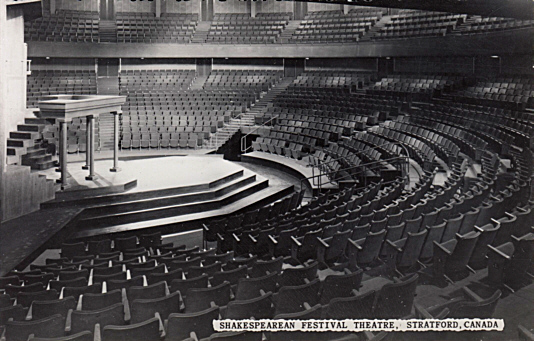 Front Text: "Shakespearean Festival Theatre, Stratford, Canada"
Front Text: "Stage, Shakespearean Festival Theatre, Stratford, Canada"
Reverse Text: "Festival Theatre Stage (Front). Straftford, Ontario, Canada. Created in 1953 by Tanya Moiseiwitsch, who redesigned it in association with Brian Jackson, the pilared platform stage brings the action of a play right into the audience." 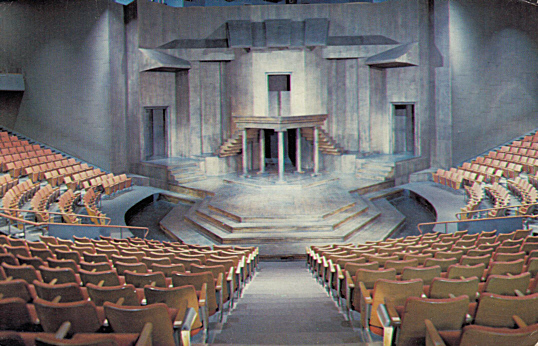 Reverse Text: "Shakespearean Festival Theatre, Stratford, Ont., Canada"
Reverse Text: "Auditorium and Stage of The Festival Theatre, Stratford, Ontario, Canada - Seating 2,258, the auditorium of this unique theatre is semicircular, built in arena style. 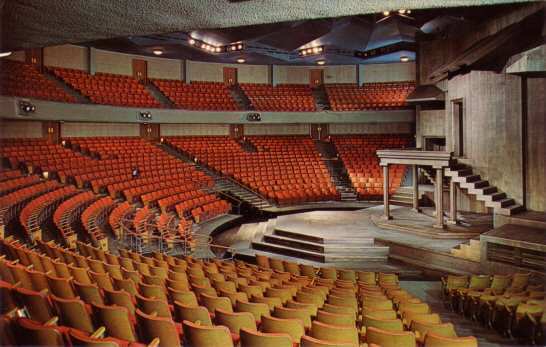 Constructed at a cost of more than $2,000,000, its productions are annually seen by more than 250,000 people."